Considerable cloudiness. Occasional rain showers after midnight. Low near 60F. Winds light and variable. Chance of rain 70%.. Considerable cloudiness. Occasional rain showers after midnight. Low near 60F. Winds light and variable. Chance of rain 70%. Pulitzer Prize-winning author Doris Kearns Goodwin speaks of George Washington’s and Abraham Lincoln’s time here. An architect’s rendering shows the front, or Rappahannock River side, of the Washington family house in southern Stafford County, as experts deduced from available evidence. The moment that many people have dreamed of for nearly a century finally arrived Saturday at George Washington’s Ferry Farm. It brought obvious joy to several hundred participants despite cool temperatures and some spring rain late in the festivities. Dignitaries from across the United States came together to break ground on an “interpretive replica” of the house where the first U.S. president’s family lived and where he grew to manhood. The ceremony was the first public step in a multi-year effort to re-create a faithful version of the Washington family’s 18th-century farm on its archaeological footprint along the Rappahannock River across from Fredericksburg. 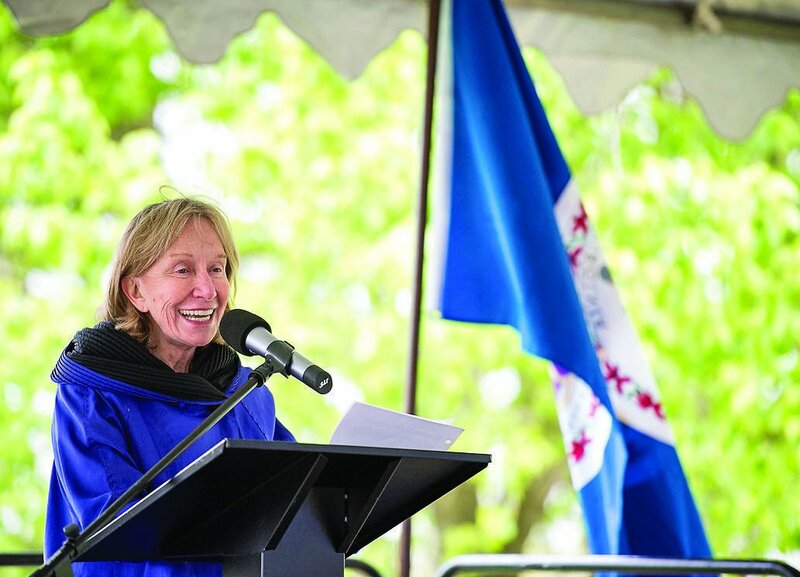 Presidential biographer Doris Kearns Goodwin hailed the event—and presidents Washington and Lincoln, who both knew Stafford well—during a keynote address that drew enthusiastic whoops and applause from the crowd assembled atop the riverbank beside the house site. Americans have wanted to recreate the Washington home since the 1920s, when the nation began anticipating the 1932 centennial of Washington’s birth. The campaign benefits both Ferry Farm and Historic Kenmore in Fredericksburg, which is also a national historic landmark. Kenmore was the home of George’s sister Betty and her husband, the patriot Fielding Lewis. The foundation, based in Fredericksburg, will strive to raise the campaign’s last $10 million from individuals, groups and corporations, President William E. Garner said. The campaign’s Washington House Challenge will match, dollar-for-dollar, up to $3 million from all gifts of $5,000 or more received by March 1, 2016. Doing its part to help, members of the Stafford Board of Supervisors presented Garner with a check for $470,000 toward the project. Local philanthropist Doris Buffett, brother of investment guru Warren Buffett, spoke movingly of her long love of the Fredericksburg area and its history. She will serve as the campaign’s honorary national fundraising chairwoman. The Buffett siblings briefly lived in Fredericksburg in their youth when their father—a political newcomer—was first elected a U.S. representative from Omaha, Neb., and moved east to take office in Washington. Goodwin, a popular TV commentator who has written best-selling books on presidents Franklin Roosevelt, Theodore Roosevelt, Lyndon Baines Johnson and Abraham Lincoln, wove together threads from the lives of Washington and Lincoln. Both men demonstrated a strong work ethic throughout their careers, she said..
“That is something that young people can learn from,” Goodwin stressed. Goodwin said Ferry Farm can also teach visitors about another chapter in American history, involving Lincoln’s May 23, 1862, visit to see Gen. Irwin McDowell and boost morale among his troops. The soldiers were camped across eastern Stafford, including Ferry Farm, which they knew had been Washington’s home. That very day, Goodwin noted, a team of Union soldiers was working in Fredericksburg to try and complete a long-unfinished monument to the memory of George’s mother, Mary, whose last home was in the city. “Nothing could be more appropriate than that our army, while preserving the Union, should also do an act commemorative of the virtues and holy memory of the mother of him who first led the armies of our fathers when they willingly gave up life and property to create this blessed Union,” a newspaper correspondent wrote then. Lincoln and McDowell reviewed thousands of troops on Stafford’s heights near Fredericksburg. The 16th president and his traveling party, which included his wife, Mary, returned to Washington that night via a boat on the Potomac River. During their voyage, Lincoln read aloud to his companions one of his favorite poems, celebrating the death of a Greek hero and his worthy deeds, which would resound throughout history. “Like the hero of this poem that Lincoln read that night, George Washington’s achievements in advancing freedom were of such magnitude that he, too, possesses an immortal name that ‘was not born to die,’” Goodwin said.